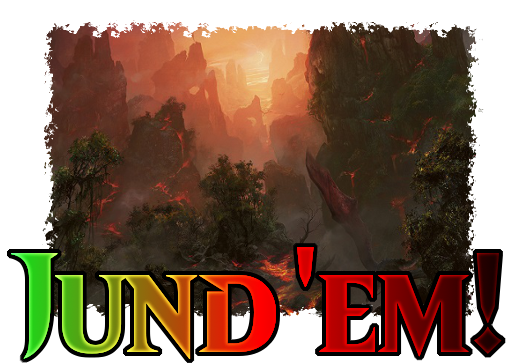 Last week, we went through the process of dissecting an archetype like Jund, and then went to work on the 8×8 theory. We decided what our 8 piles would be, and this week, I’m going to go over those 8 piles, what’s in them, and the commander who will be in charge of them! Now, this series is already 3,000 words (whoof!) so I’m not going to go through every single possible permutation. I’m also going to talk about the choices I make based on budget, and throw in examples that I’d use if I had a lot more money to blow on this. Anger, Brawn, Dread Return, Kessig Cagebreakers, Mortivore, Splinterfright, Jarad, Golgari Lich Lord, Boneyard Wurm. This is the combo kill that excites me; anger plus an outsized creature big enough to trample over and win out of nowhere. All you need to do to make this happen is fill your graveyard enough, which will be enabled by our dredge package. One thing I like about this is that some of the cards in it don’t really need to be involved in the combo to be good. Kessig Cagebreakers is a perfectly legitimate threat with only one creature in the bin – that’s when it serves as a 5/6 for 5. Jarad is even better, since he can jump out of the bin on his own, and I don’t need the Anger/Brawn in the bin to make him scary. If he does have backup from either of those, though, he is an absolute game ender, and he can also circumvent combat entirely in the late game. Golgari Grave-Troll, Shambling Shell, Stinkweed Imp, Golgari Thug, Grave-Shell Scarab, Golgari Brownscale, Life from the Loam, Dakmor Salvage. I tried to limit the dredgers to cards that are worth casting in and of themselves. The creature that’s most on the edge is the Grave-Shell Scarab, because it doesn’t dredge for a lot, and its value as a creature is mostly that it can bounce back to your hand very cheaply – or you can cycle it away for a mana. This also ties into our resilience plan: Golgari Grave Troll is a pretty beefy threat and with the Brawn and Anger in the bin, it’s beefy with trample and haste. Shambling Shell is a nice vicious hitter that can jump into the yard and enable dredge if that’s what you need. Overall, these cards are just here. You could justify using Life From The Loam with cycling lands later on, but that tends towards pulling the deck towards control, or utility lands, which is slow and spends a lot of time on cycling and dredging – while this deck wants to dredge in big chunks or just use the cards as aggressive threats. Also, don’t sell short the value of Golgari Thug: If it gets milled into your yard, you can dredge it, let it die, then use that to retrieve a card like Eternal Witness or similar. Putrid Leech, Rakdos Guildmage, Lotleth Troll, Nath of the Gilt-Leaf, Bloodbraid Elf, Sprouting Thrinax, Nezumi Shortfang, Siege-Gang Commander. Not all of these are perfect and some of them are kinda pet cards. Particularly, I will always try and find excuses to play with Nezumi Shortfang, who when you really boil it down is at best a combination of The Rack and Hill Giant? Rakdos Guildmage on the other hand is really flexible and explosive in the late game, can fuel discard and removal, and threatens to trade up with lots of things it can fight. Nath is just a big disruptive creature, and much like Bloodbraid Elf or Sprouting Thrinax get you extra cards. Siege-Gang Commander is just big – and better if you can bring it back. Also, the commander on its own can cast Dread Return from the graveyard. There are some maybes for this slot; I played with some level-up creatures here, and they weren’t particularly amazing and the Putrid Leech is kind of not as exciting as it could be? Civic Wayfinder, Fertilid, Farhaven Elf, Wood Elves, Yavimaya Granger, Courser of Kruphix, Moriok Replica, Merfolk Branchwalker. Mostly these are cards that I play to keep the board advancing. None of them are amazing per se, but I would rather make a threat and get a land in hand or on the board than just go get a land like with Rampant Growth or Sakura-Tribe Elder. The oddball in this pile is Moriok Replica: technically, it doesn’t advance your board. Still, it’s a useful draw spell and can help you last until the mid to late game by blocking something and cashing in for cards. I’ve considered if this slot should be hand attack/disruption cards instead; in that case I’d be picking up pieces like Mournwhelk or Sanity Gnawers. Sarkhan, the Dragonspeaker, Bane of the Living, Brimstone Mage, Bone Shredder, Terminate, Polukranos, World Eater, Shriekmaw, Putrefy. This particular vein is so dense! The thing I was trying for with this stack was to get things that ideally were creatures in the bin, and crucially, to use cards I already own. Sarkahn is a great card for my tastes, since he does a passable impersonation of a Flametongue Kavu. If you have those, they probably want in here in place of the Brimstone Mage. Sylvok Replica, Mockery of Nature, Vithian Renegades, Molder Slug, Reclamation Sage, Indrik Stomphowler, Mold Shambler, Acidic Slime. Another deep vein. I’m not sure how great any of these are; I’d almost want to replace cards like the Stomphowler and Replica but the corners where they’re useful are so useful, like when you’re using the Replica with Oversold Cemetary to repeateldy blow up artifacts; a Creeping Mold might make a good, searchable option, though to replace the Vithian Renegades that can pop Planeswalkers? Or maybe some good 4-mana flexible burn spell? Deadbridge Goliath, Vengevine, Doomed Necromancer, Dark Deal, Dimir House Guard, Garruk, Caller of Beasts, Xenagos, the Reveler, Eternal Witness. The purpose of this package was to be cards that can carry the game on their own making them powerful top-decks, or ways to bounce back from particularly rough board wipes. There are some pet cards here, too – the House Guard’s job is to go and fetch up one of the deck’s four-drops (two in this package, Mold Shambler, Polukranos, Bane of the Living, Dread Return or Jarad – not a perfect every-problem toolkit, but a lot of powerful things for most situations). I’m not sure on this Garruk; Caller of Beasts in this deck looks like ‘draw 2-3 extra cards a turn,’ but Wildspeaker would advance mana plans and could help break board stalls. I like the Dreadbridge Goliath as a post-wrath monster; it’s big and chubby and if it dies it makes the next threat a lot scarier – even a Merfolk Branchwalker looks pretty scary as a 7/6. Dark deal is the oddball in here too: It’s there because I wanted to be able to do a big dredge out of a hand that’s otherwise dead. It might be a mistake compared to other options (that I can’t afford) like Wheel of Fortune. Cathartic Reunion, Phyrexian Delver, Victimize, Oversold Cemetery, Insolent Neonate, Reforge the Soul, Runehorn Hellkite, Ever After. Now here’s the effects that are here to replicate other packages’ effects or enable the way they work. Catharic Reunion, Neonate, Reforge and Runehorn are all here to do a big dredge or restock you if you’re behind. Ever After can retrieve a Yavimaya Granger and something else, knowing that the card can be shuffled up from the bottom. That’s our deck core. Next steps? Picking the commander, building the deck, and playing some games!